I recently printed a Mail message as a PDF file and chose iCloud as the destination. I thought it would show up in Preview’s iCloud file storage but it’s not there. Nor is it in the Pages file storage. Any idea of where it is and how I can get to it? I do. But before we get to that, let me recount your steps for the benefit of those readers just getting out of bed. From the sheet that appears, click on the PDF menu and choose Save as PDF. In the next sheet that appears choose iCloud from the destination pop-up menu. This is something you can do from within any application that supports iCloud’s Documents in the Cloud feature. I spell it out so that readers understand that what you’ve done can’t happen by accident. It’s a many-stepped and purposeful process. So what happens now? If you’d done this in Pages, for example, you could launch Pages at a later time and, from the Pages documents window, find your PDF file. However, you’ll notice that it bears a gray tint. That indicates that it can’t be opened in Pages, which makes a modicum of sense given that Apple has determined that Preview is the application for PDF files and not Pages. However, here’s where sandboxing comes in. That file is stored among Pages’ documents, not Preview’s. And so when you choose Preview's Open command, you won’t see the file because it’s locked away in a different application’s sandbox. Fortunately, in this case the solution is easy. 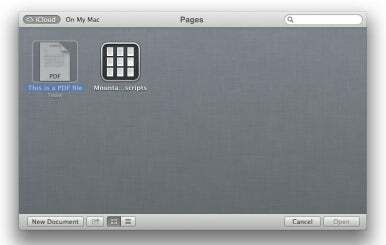 Just drag the file out of Pages’ documents window to your Mac’s desktop. It will be moved from iCloud to your Mac. At that point you can do with it what you like. But you’re not interested in Pages or Preview, you want to know about Mail. The interesting thing here is that while Mail will allow you to save printed PDF files to iCloud, there’s no way to access them because Mail doesn’t have a documents window. Likewise, if you were to go to icloud.com and click on Mail, you’d find no storage location for anything created by Mail. It doesn’t exist. This folder is your safety net for those times when your documents appear to have been sent on a one way trip to Nowheresville. It’s not a folder you want to rely on, though. Your best bet is to simply not try to save printed PDF files to iCloud. My guess is that Apple simply didn’t notice that through the Print PDF command you can save documents to iCloud. I expect if this becomes a serious problem, an OS update will disable the option to save these files in the ether.